Use bags about 14-18″ wide, and 30-36″ deep. 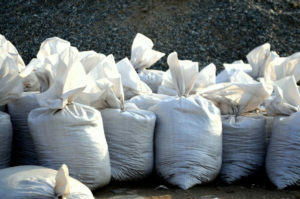 Sandbags should be filled half full for easy stacking and will weigh approximately 30 pounds. Thirty sandbags are equal to approximately ½ ton (one ton is 2000 pounds) and is the maximum legal load limit for a ½ ton truck. Sandbags should never be used to build a fortress around the perimeter of one’s property. Doing so can actually trap flood-waters between sandbag walls and structures, leading to further damage.